Chinese automaker Geely has become a shining star in its domestic market by selling affordable small cars to buyers hungry to jump off their scooters and into auto ownership. Now it wants to build up its image and international credibility with a takeover of a Swedish corporate icon prized for its safety technology and reputation for quality: Volvo. Ford Motor Co. said Wednesday it picked Zhejiang Geely Holding Group Co. Ltd.'s as its preferred bidder to buy its Volvo unit. Terms of Geely's bid were not disclosed but estimates for a transaction price are in the US$2-billion range. "Ford believes Geely has the potential to be a responsible future owner of Volvo and to take the business forward while preserving its core values and the independence of the Swedish brand," Ford Chief financial officer Lewis Booth said in a statement. "But there is much work that needs to be completed." There is no specific timeline to conclude the negotiations, Mr. Booth said. Ford will not retain a stake in Volvo, he said. Geely welcomed the development, saying Volvo's manufacturing plants, research facilities, union agreements and dealer networks would all be maintained. Volvo management would be independent and headquartered in Gothenberg, Sweden, Geely said. 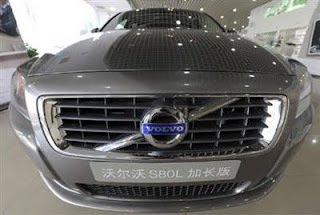 The company said it would enhance Volvo's access to sales networks and parts sourcing opportunities in the growing Chinese market, where automakers now sell more new vehicles than the United States. But exactly how a deal will play out is unclear. Ford said that in any sale the deep connections between Ford and Volvo in shared component supply and engineering would have to be resolved. The Detroit maker of F-150 trucks and Focus cars is understood to be worried that its patents and other intellectual property may leak to rivals in China. The nature of Chinese state involvement in a transaction and subsequent ownership is also unknown. Geely said its bid is backed by "Chinese banks" which it did not name. Chinese automakers are desperately trying to shed their reputation for low-quality so they can grow their share of the domestic market and speed up their export capablity. In 2008, barely one in three new vehicles bought in China were Chinese brands. By leveraging the capacity of some parts suppliers and selectively buying some of them, Geely has introduced several vehicles and brands at higher price points than its namesake Geely marque, China-based auto consultant Bill Russo said in an analysis published Oct. 27. These include Gleagle, London Taxi, Shanghai Maple and Emgrand. "Geely intends to increase their brand equity by sourcing from the world's leading auto parts suppliers, and in the process upgrade their image from a maker of ‘affordably priced cars' to one that delivers ‘safe, fuel efficient, and environmentally-friendly cars,'" Mr. Russo said. However, unlike previous acquisitions by Chinese companies of Western automotive assets like SAIC's purchase of the Rover brand, a deal for Volvo isn't about buying off-the-shelf technology for a cheap price. And some analysts say Geely may be biting off more than it can chew. "I'm somewhat stunned to be honest that Ford are even entertaining it," said Paul Newton, a London-based analyst for IHS Global Insight. "If [Geely] was a larger concern with a bit more international experience, I'd say that ‘Yeah, it could well be a positive thing for the Chinese companies.' But Geely I'm not so sure. They don't have a joint venture. They don't have any alliances with anyone. And they're buying a very complex, subtle, European premium brand that is struggling." Chinese automaker Geely has become a shining star of its domestic market by selling affordable small cars to first-time buyers hungry to jump off their scooters and into auto ownership. Ford Motor Co. said yesterday it picked Zhejiang Geely Holding GroupCo. Ltd. as its preferred bidder to buy its Volvo unit. Terms of Geely's bid were not disclosed but estimates for a transaction price are around US$2-billion. "Ford believes Geely has the potential to be a responsible future owner of Volvo and to take the business forward while preserving its core values and the independence of the Swedish brand," said Lewis Booth, Ford's chief financial officer. Geely welcomed the development, saying Volvo's manufacturing plants, research facilities, union agreements and dealer networks would all be maintained. Volvo management would be independent and headquartered in Gothenberg, Sweden, Geely said. The company said it would enhance Volvo's access to sales networks and parts-sourcing opportunities in the growing Chinese market, where automakers now sell more new vehicles than the United States. The nature of Chinese state involvement in a transaction and subsequent ownership is also unknown. Geely said its bid is backed by "Chinese banks" that it did not name. Chinese automakers are desperately trying to shed their reputation for low quality so they can grow their share of the domestic market and speed up their export capability. In 2008, barely one in three new vehicles bought in China were Chinese brands. By leveraging the capacity of some parts suppliers and selectively buying some of them, Geely has introduced several vehicles and brands at higher prices than its namesake Geely marque, China based auto consultant Bill Russo said in an analysis published on Tuesday. These include Gleagle, London Taxi, Shanghai Maple and Emgrand. "I'm somewhat stunned to be honest that Ford are even entertaining it," said Paul Newton, a London-based analyst for IHS Global Insight. "If [Geely] was a larger concern with a bit more international experience, I'd say that 'Yeah, it could well be a positive thing for the Chinese companies.' But Geely, I'm not so sure. They don't have a joint venture. They don't have any alliances with anyone. And they're buying a very complex, subtle, European premium brand that is struggling."